In order to apply for permanent residence, a relative or American employer must file an immigrant petition on your behalf. Family-sponsored and employment-based petitions are subject to visa limitations unlike petitions filed by immediate relatives who are US citizens. Immediate relative petitions remain unlimited and are always available. 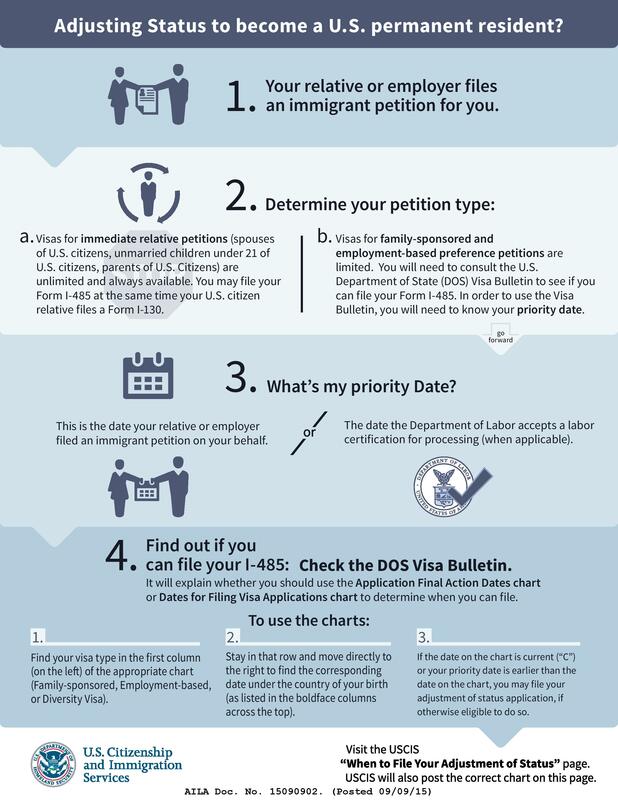 This means that if your petitioner is your immediate relative and a US Citizen you can file your I-485 at the same time as your immigrant petition. In order to understand whether a visa is available to you and whether you can proceed with filing your application for permanent residence, you will need to keep a close eye on the Department of State’s Visa Bulletin. For more information please call us for a free consultation.